04.44: Well, in the first update tonight, I said we weren’t expecting a result until at least 5am, so to be closing shop before can be considered a success. You can find our story on the result, including Biggs’ acceptance speech, here. 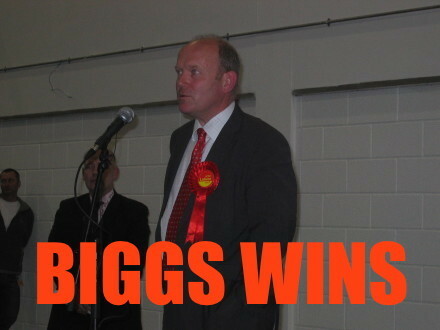 04.30: John Biggs has won, it has been confirmed to me. 04.00: Labour got 27,255 in the first round, Rabina Khan got 25,763. Imagine there will be around 6,000 applicable second preferences, of which 80% or more will likely go to Labour. In the end, Biggs may have a majority of 7,000. 03.54: John Biggs was ahead by 1,500 in the first round, it has been confirmed. Almost impossible for him to lose from this position. 03.38: There will be no first round announcement, I’m told – but second preferences are now being counted, so no candidate reached 50%. Will try and track down the latest on what the first round looked like. Last we heard, Biggs was ahead by 2-3,000 votes. 03.21: They are just going through the spoilt ballot process now, but as things stand, there is no reason to believe that the slight delay in announcement should be a worry. 03.05: We will get the first round results in the next ten minutes. It will go to second preferences, and if Biggs is anything less than 3,000 behind he will “walk it” in the second round – however, Labour are confident that he should be just ahead in the first round. Then, barring recounts (fingers crossed, touch wood, throw salt over your shoulder), the final result will be announced between 04.30 and 05.00. 02.53: First round results expected shortly. Hopefully. 02.42: Other than turnout, what has changed about the vote from 2014? Well, last year’s vote took place on the same day as the European election which inflated the Green and, more importantly, the UKIP vote. The UKIP surge could have had a significant role in curbing Labour’s vote in this race last year – and while you can give a second preference, many do not use the option. UKIP’s vote appears to have declined, and should help Labour. 02.34: Big grin from Biggs as he arrives at the count. He must have been reading the liveblog at home. 02.25: It is still expected that it will go to the second round, but a rough count puts John Biggs around 2,000 ahead on first preferences. If the final result is anything along these lines, it would likely deliver him a healthy majority on second preferences. 02.15: One person I have just spoken to at the count is confident that Labour are going to win. It will go to the second round, they say, but Biggs and Khan are too close together in the first round for Khan to win – she is simply not picking up any second preferences. Too early for any official sources to brief this out, but last I heard from the party was that “signs are generally positive”. The second placed independent is the Lutfur Rahman/Tower Hamlets First candidate, but the party has been deregistered. 01.47: Stepney Green is “bit of a swing seat” and a “barometer” someone at the count tells me. If Rabina Khan was going to win, she would have been hoping to win it. Nothing really conclusive, but it is a good sign for Labour. Positive signs are coming from the votes generally. At the moment, Biggs could be a few thousand ahead. As with 2014, Biggs seems to be scooping up the vast majority of second preferences, while Khan is struggling on that front. If it goes to the second round, and Biggs and Khan are close, we can expect a Biggs victory. 01.40: As reported earlier, Stepney had a relatively high turnout of 47% and is a gain from Tower Hamlets First. This all bodes well for John Biggs in the Mayoral race. “Looks very likely now,” says a source. 01.37: RESULT. Labour’s Sabina Akhtar has won the Stepney ward by 170 votes – that gives Labour a majority on the council. 01.35: Expecting announcement shortly of Stepney ward result. 01.27: While turnout is down on last year, when the mayoral vote took place on the same day as the European and local elections, it is significantly higher then the 2010 mayoral election turnout. Like today, that was a standalone vote, and turnout was a mere 26%. Comparatively, and especially when a recent general election is taken into account, that makes today’s turnout pretty high. 01.12: Back of a fag packet maths says a candidate would need around 34,800 votes to win on the first round. Not impossible, but 700 more than Biggs managed on the second round last time. If it is at all close after first preferences have been counted, it will be good news for Labour. Biggs won 6,000 more second preferences than Rahman last year. 01.03: Turnout – 37.7%, 69,643 votes cast. That’s down pretty much exactly 10% on last year, when Rahman won with 43% and 37,395 votes on the second round. 01.00: Turnout is 37%. That’s around what had been expected (perhaps slightly on the high side), but there is not much that can be read into that with regards to the final result until we start seeing where turnout is high or low. 00.40: As mentioned earlier, there is a council by-election taking place in the borough tonight. Stepney ward has been to the polls again after Alibor Choudhary was implicated in the Rahman verdict. Turnout is an impressive 47% there. 00.21: Just spoken to a respected veteran of Tower Hamlets politics, who says to me that support for Biggs and Khan is so different across various parts of the borough that it will be impossible to make an informed prediction until many of the votes have been counted. They also point out the enormity of tonight’s result. If John Biggs wins, it could kill off Lutfur Rahman as a serious force in the borough – but if Rabina Khan wins, then it proves Rahman and his acolytes can win even in the face of disgraced disqualification. 00.04: Counting has just begun – could we actually have an early result? Earlier, a very good source gave me an estimate of 5am. Now, I’ve just heard something to raise my spirits: it could potentially be much earlier than that. With a low turnout (“30-35%” reckons one), no concurrent council elections (except one council by-election) and the same number of council staff as last year, it might not be such a long night after all. Or maybe I’m just trying to make you all stay up with me. 23.44: Some mixed news now. I’m hearing that turnout was “abysmal” in many good Labour places, including Isle of Dogs – although one doorknocker in that area said they felt it had been a good response. When I spoke to people running committee rooms earlier today, there was real concern about the number of activists out. After such a big effort by Labour troops in the run up to such a big defeat a month ago, party sources concede it has been difficult to energise activists for this by-election. 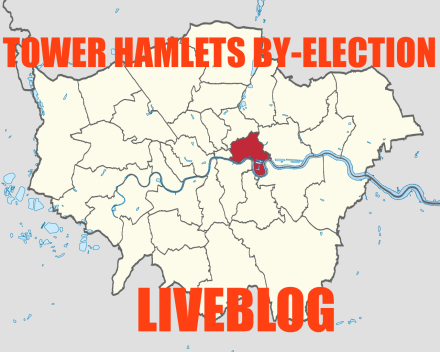 23.07: I liveblogged last year’s Tower Hamlets marathon five-day election count, and during that time Labour were confident until quite late on in the mayoral count, which lasted until Saturday. This year, the party is far less likely to declare anything as ‘good news’ until they have a clearer picture of how things are turning out. Having said that, I have just spoken to a source at the count who tells me that some sampling in what they consider “Rabina Khan territory” show Labour neck and neck with the independent. As a disclaimer, these are early, early signs – but they are tentatively positive for Biggs. 22.53: So, what of electoral shenanigans? That is, after all, why I am unnecessarily staying up all night on a Thursday. In April, Lutfur Rahman was found guilty of a host of actions, including using taxpayer-funded grants to induce votes, of bribery and corruption, and of corrupt practices of undue spiritual influence. However, they weren’t the only issues that were raised about last May’s elections, and the police have increased paroles of polling stations today and marked out clear ‘safe zones’ outside to limit reported problems of voter intimidation. A raucous crowd of Rahman supporters gathered outside the count last year after his victory was apparent, causing police to lock people inside – this year the count is being held in the Excel centre, outside of the borough, to avoid this problem. However, there have been allegations of impropriety already. Police are investigating reports of allegations of harvesting of postal votes, use of ‘ghost’ voters and improper distribution of election literature. Out on the doors with a team in Bow for John Biggs. Polls close at 10pm. 22.25: The election is set to be quite close between Labour’s John Biggs and independent candidate (backed by Lutfur Rahman) Rabina Khan. Turnout is slightly higher than may have been expected given the general was only a month ago – and if Labour are not claiming this is necessarily a good sign, they are not conceding it is a bad one. The fascinating thing about this election is that it will be impossible to extrapolate any wider meaning from it, no matter what the result. Tower Hamlets politics is unique, and seems to be so different even from its neighbouring boroughs that it would be difficult to take Labour’s result and take from it a sign how the party will do in next year’s London wide election. With many hours ahead of us, please do not expect updates to come as thick and fast and exciting as this throughout the night. 22.10: Hello, and welcome to the first LabourList election liveblog since… erm, well, yes. Moving swiftly on, I’m Conor Pope and I will be running tonight’s coverage of the Tower Hamlets mayoral by-election coverage, which was prompted by Lutfur Rahman’s unceremonious booting out of office after being found guilty of electoral fraud. We are not expecting a result until 5am, and do not be surprised if there is nothing until 7 or 8 o’clock. Still, that’s a fair leap forward for anyone who remembers the election last May, when the count lasted for five days. I sincerely hope it will not last five days, but I cannot promise anything.